Fractional lasers, both ablative and nonablative [Figure 1], are based on the well-established concept of fractional damage to the skin which enable a rapid healing as compared to the conventional ablative lasers as the intervening skin is intact for the reparative process. ,, A secondary effect is the dermal remodelling induced in the dermis beyond the narrow zone of coagulation induced by the fractional lasers. ,, The carbon dioxide (CO 2 ) laser has a predominant coagulative and necrotic effect (horizontal effect) as compared to the erbium:yttrium-aluminium-garnet (Er:YAG) laser, which has a dose-dependent increase in depth with less necrosis or coagulative effect (vertical effect). Thus, resurfacing procedures may be thought of as having both horizontal (tightening effect) and vertical (depth) treatment vectors on the tissue. Probably, the CO 2 lasers have more of a horizontal effect while the erbium laser has a more vertical effect. For atrophic acne scars, it is important to choose a modality that reaches the appropriate depth to target the deep, boxcar and ice pick scars while concomitantly treating the superficial scars. The conjecture that fractional lasers are effective for acne scars is derived from the fact that the microcolumns (microscopic thermal zone) act akin to the effect of 'needling' which helps to detach the tethering of scars and creates sufficient 'collagen remodelling' to 'lift' up the atrophic scars. Resurfacing procedures are considered by some to be the gold standard for the treatment of postacne scarring, and the mechanism is probably a combination of vertical ablation and horizontal 'tightening' of the tissue. However, it has been proven by experience that no amount of stretching out or ablation of deep dermal and subcutaneous structural loss with resurfacing tools can completely ameliorate the deep scars. The effect of thermal remodelling works in consonance with the depth achieved and thus the histological confirmation of the depth of the microthermal zone (MTZ) is probably more important for scar-specific improvement. Interestingly, while the face is the focus of fractional laser in acne scars, the seminal studies used the forearm for histological assessment. ,,,, The paucity of appropriate histologically directed studies in relation to facial acne scars is probably because of a lack of volunteers for histological assessment, which contrasts with the plethora of clinical studies in acne scars where the evidence of improvement is usually based on subjective assessment. Our aim was to focus on the importance of histological assessment for evaluating the effectiveness of fractional lasers in acne scars and the lacunae that exist in the present published data. Our review was based on the published literature where fractional lasers used for acne scars have been mentioned. This was done by carrying out a PubMed search till October 2011 using the following terms 'fractional lasers, acne scars, histological assessment''. The doses used and the histological depth achieved with each laser were collated and analysed by Graph Pad Software (http://www.graphpad.com) and the statistical graphs were derived using Free statistics software (www.wessa.net). Also, all the clinical studies were analysed and a detailed analysis of the results achieved was done statistically. Tests of association, correlation and the t-test were used for analysing the data. In our review, we will first focus on the histological assessment of the fractional lasers relevant to facial skin histology. We will also discuss the histological and clinical variability induced by different laser settings. Based on the existing data and appropriate statistical analysis, we will try to arrive at the depth achieved by various fractional lasers and propose a dose-depth correlation for the different technologies. Last, we will analyse the existing studies of fractional lasers in acne scars and compare statistically the results between ablative fractional resurfacing (AFR) and nonablative fractional resurfacing (NAFR) lasers to arrive at an unbiased opinion on the superiority, if any, between the two technologies in relation to acne scars. The fractional lasers [Figure 1] can be classified broadly into two types, the NAFR lasers and the AFR lasers. We will largely focus on three lasers commonly used, the Er:glass (1550 nm, 1540 nm), Er:YAG (2940 nm), and CO 2 (10,600 nm). It is largely believed, in spite of the lack of well-done comparative studies, that the AFR is better than NAFR for acne scars. On analysing the data [Table 1], it was obvious that the histological laser tissue dynamics is largely based on specimens that are derived from ex vivo tissues [Figure 2]. ,,,,,,,,,,,,,,,, In studies where an in vivo model was chosen, ,,,, only two studies had focussed on the face [Table 1]. , For validation of fractional lasers, ideally the central face should be used but probably a more practical substrate would be the pre- and post-auricular skin. Though numerous classifications of acne scars have been proposed, ,, the simplest way is to divide them into hypertrophic and atrophic scars. The fractional lasers are predominantly used for the atrophic scars [Figure 3]a. The clinical implication of the depth of penetration of the lasers is particularly relevant in treating acne scars. ,, The rolling scars are a consequence of the destruction of the subcuticular fat, ,, which leads to abnormal fibrous anchoring of the dermis to the subcutis [Figure 3]a. ,, Clinical experience suggests that they are amenable to lasers that penetrate up to the papillary dermis. Ice pick scars are narrow (<2 mm), deep, sharply marginated epithelial tracts that extend vertically to the deep dermis or subcutaneous tissue apex and it is believed that their depth is below than the depth of conventional skin resurfacing options and they rarely respond to fractional lasers. ,, Boxcar scars may be shallow (0.1-0.5 mm) or deep (≥0.5 mm) and are most often 1.5-4.0 mm in diameter [Figure 3]a. Logically, shallow boxcar scars and most deep boxcar scars are amenable to fractional lasers. There are some basic tenets  in the treatment of acne scarring, the first being that there is no 'magic wand' therapy for all cases; each scar and each patient must be treated individually and the scar topography is usually the target of most interventions. The second tenet is that deep scars invariably require excisional surgery but even this leads to a modified contour while the scar is not completely effaced. As acne scars are usually a mix of ice pick, boxcar and rolling scars, the final effect of fractional lasers would largely depend on the predominant scars and the type of laser used. The depth-width ratio (DWR) for most fractional lasers is about 4-5. The higher the DWR, more the dermal volume that can be thermally damaged. As the width of most fractional lasers is almost the same due to the intrinsic quality of the fractional 'technology', the depth is the variable factor that may play a predominant role in fractional laser efficacy. [Figure 3]b gives an overview of the depth achieved but these data ,,,,,,,,,,,,,,,,,,, are largely from ex vivo substrates. The varied indications of the fractional lasers have not been consistently backed by site-specific histological studies. Histological data are essential to arrive at proper dosimetry and various issues have to be ironed out with regard to histological analysis, some of which will be discussed in this review. Our focus will be in context to acne scars which is a useful template to extend the use of the fractional lasers for other indications. The data from the existing studies [Table 1] are variable and lack homogeneity as there is a marked variation in the histological parameters and laser settings used. The other studies where facial skin was studied were either not formally directed towards histological assessment  or could not demonstrate a marked clinical improvement  even though there was a histological increase in collagen and elastin. The importance of this is that the depth of penetration provided by various laser manufacturers does not account for this and thus the dosimetry suggested is probably not reproducible for use in facial acne scars. Even if we factor in the accepted variability of depth,  there is very little in vivo data on the histological depth of the normal facial skin which are crucial to extrapolate the variable depth generated by various fractional lasers. ,,,,,,,,,,,,,,,,,,, It has been estimated that the facial skin depth (forehead, nose, medial and lateralcheeks, lips and chin) is about 2196 μm, which is composed of the epidermis (105 μm), papillary dermis (105 μm) and reticular dermis (1986 μm). The predicted depth achieved (2-5 mm) with ablative fractional lasers ,,, on abdominoplasty tissues may not be clinically applicable or relevant on the facial skin. Moreover, any AFR with a depth beyond 2200 μm (ex vivo substrate) will have no additional advantage in real in vivo scenarios, as on the face, it will exceed the total skin depth (2196 μm). The time of biopsy also varies in studies ranging from zero to few hours to 24 h after the laser sittings. A few studies ,,, have also assessed the tissue after 2-3 months when the collagen remodelling takes place which is more useful as it helps to assess the end result achieved. A recent study though has found that the histological changes can be seen up to 6 months to 1 year after the procedure. Thus, ideally a biopsy at 6 or 9 months would give a more relevant picture of the extent of neocollagenisation which has a role in acne scar improvement. The drawback of repeated biopsies though is that the same area cannot be biopsied each time, and thus, the second biopsy can never replicate the exact tissue response. The laser that we use (Dermablate 2940, microspot mode Ascepelion) has a demonstrable effect on collagenisation and a tissue response up to a depth of 1500-2000 μm (data provided by the company) which is evident only after 2-3 months. The microcolumn injury produced has roughly a conical shape. Thus a difference in sectioning angles may change the interpretation of the depth. ,, To circumvent this, a laborious technique is to take multiple serial sections so that an average tissue depth/diameter can be assessed. Another way-by no means easy-is to perform treatments in triplicate to provide an accurate representation of the tissue injury at a given treatment parameter. The depth/diameter of an MTZ has also variable assessment methods. In a study by Hantash et al., , the maximum dermal ablation width of the laser channels was used whereas Skovbølling et al. used the width at a defined localisation at the interface of the lower one-third and the upper two-thirds of the microcolumn. To complicate matters, another study  determined the depth of each MTZ by measuring the distance from the stratum corneum level to the deepest non-viable cell within the confines of any lesion. This lack of homogeneity makes comparison of studies difficult. Several theoretical and non-invasive biomedical, optical and acoustical methods have been used in the evaluation of tissue damage arising out of fractional lasers impacting the skin. ,,,, Most of these like optical coherence tomography and ultrasound-modulated optical tomography are expensive, require skills and have a limitation of depth up to 1.5 mm. ,,,, As the dermis scatters the light strongly, the signal to be detected is small; thus, biomedical optical engineering devices are difficult to standardise for skin pathologies. A recent study  has used high-resolution ultrasound imaging to evaluate the effect of the CO­ 2 fractional laser. It was found that while the dermal thickness increased, the epidermal thickness was unchanged which means that though dermal collagenosis might occur, the skin retains the sequelae of ageing. It has been shown that both the DeepFX  and Lux 2940  achieve a greater depth if there is an increase in the number of pulses. It has been shown that , if the pulse width of the AFR (2940 nm) is increased to 2 ms, the heat impacting on the dermis increases whereas if it is lowered (0.25 ms), a deeper penetration can be achieved. In a study on an ex vivo model with the fractional erbium laser, reducing the pulse duration from 2-5 to 0.25 ms caused a 20-25% deeper penetration of the microbeams. A similar effect has been noted with the fractional carbon dioxide laser  where the depth increased by 10-fold when the pulse duration was reduced from 5-10 to 2 ms. The density of the 1550-nm lasers ranges from 100 to 1000 microbeam/probe. ,,, Obviously, higher the density, more the dose (joule/cm 2 ) that can be achieved. By manipulating the density of the microcolumns, a more aggressive treatment may be achieved in a single treatment. This can be achieved by giving multiple passes. However, when retreating or passing over a treated area multiple times, a non-uniform damage is achieved. Regardless of the mode of delivery, with repeated passes all devices lead to a randomly distributed placement of MTZs. Clustering of MTZs (i.e. placement of individual MTZs into a location that was already damaged) can occur with subsequent passes and lead to alterations in the MTZ size and fill factor. It can be conjectured that the approach of giving multiple passes to achieve a high density and energy is logical and in spite of numerous passes (1-30), the healing can still occur. A study by Trelles et al. using the Sciton Profile Er:YAG system showed that multiple passes produce photothermally related effects in the dermis. The repeated pulses first ablated the epidermis which created a 'window' that helped the dermis with its high water content to heat up adding to the residual thermal damage zone. This effect is useful for acne scars as there is collagen remodelling. Contrary to this view, another study  pointed out that multiple-pass treatments, which are recommended for all fractional laser devices, created an increased broad-based destruction of the DEJ over a larger surface area. This was because the higher energy multiple-passtreatments demonstrated a more superficial treatment than anticipated for their respectivefluences that may be attributed to the potential absorption and concentration of energy or heat at the DEJ. The depth of penetration of fractional lasers is probably a crucial parameter for improving acne scars. ,,,,,,,,,,,,,,,,,,, The most important factors predicting the depth are the density and the energy settings. An increased energy level leads to a non-linear increase in the depth of penetration. A study comparing two NAFR  lasers (Fraxel SR750 vs SR1500) found that the depth increased from 386±68 μm to 826±108 μm on increasing the dose from 6 to 40 mJ using the Fraxel SR750. The newer Fraxel SR 1500 achieved a deeper penetration (470±56 μm, 1408±53 μm) for proportionately higher energy (6-100 mJ). It is striking that for lower energies (up to 20 mJ), there was no difference or only a marginally significant difference in the lesion width and depth between the two devices. However, for higher energies (over 20 mJ), there was a statistically significant difference in diameter and depth. A study using the fractional CO 2 laser found a proportional increase in the depth and width depending on the density and dose (0.03-0.15 mm; dose 90-100 mJ). This study used density levels 1-3 which predicted the overlap ranging from -10% to +10%. An increase in the density caused an increased depth of ablation while an increase in the dose (energy) affected the width of coagulation. Paradoxically, a study which used the fractional Er:YAG laser (2940 nm)  revealed that though the standard predicted depth of ablation ranged between 25 and 1500 mm, the actual achieved depth was much greater than the predicted. Very few studies have formally compared the laser depth of fractional lasers. Farkas et al. demonstrated that even within the same technology, AFR (ActiveFX, DeepFX, Fraxel repair), the depth of penetration may vary [Figure 3]b. It was initially believed that it is not possible to compare NAFR and AFR as the tissue responses would vary. This is not the case as studies with detailed tissue depth analysis , have shown [Figure 3]c that the tissue response is remarkably similar. All the three laser systems (2940, 1540 and 10,600 nm) produce an MTZ which has an inner and outer diameter, a zone of ablation and a deeper zone of coagulation, and thus, probably have similar effects on the skin. The only difference is that the AFR lasers have less width of damage than the NAFR [Figure 3]c.
The existing studies [Table 1] have not formally explored the correlation between depth and energy. For the 1550-nm fractional laser, it has been previously estimated that for every millijoule of increased energy, the depth of coagulation increased roughly by a factor of 10 μm (10 mJ/100-150 μm). Similarly, for the fractional CO 2 (10,600 nm), a formula to estimate the depth has been proposed, where the ablation depth (μm)=12 μm/mJ×energy level (mJ). The fractional erbium:YAG laser has a predicted ablation that starts above a defined threshold (ablation threshold), which is 1.6 J/cm². Energy densities less than 1.6 J/cm² heat up the tissue and may lead to thermal damages. Each subsequent increase in energy (J/cm²) ablates 5 μm of the tissue. Thus, the depth is predicted by the formula depth, D (μm)=5 μm/J/cm² × (F-N ×1.5 J/cm²), where F is the fluence (J/cm²) and N is the number of stacked pulses (Dermablate microspot mode; Ascepelion). 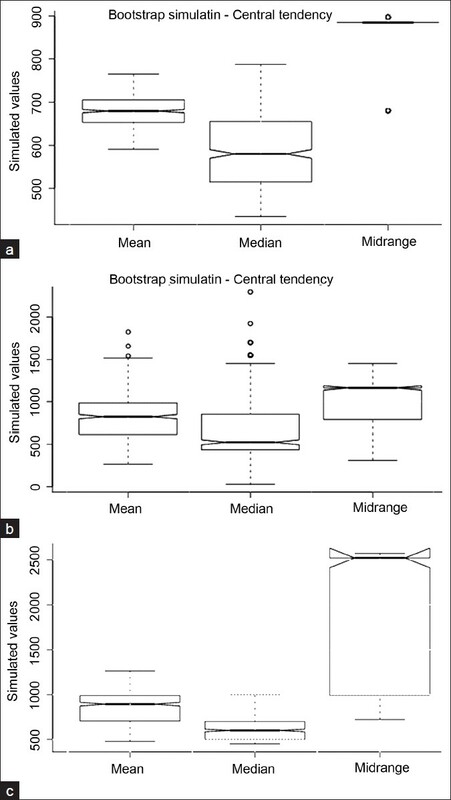 On statistical analyses of the existing data [Table 1], we found that there was a statistical correlation between the dose and depth achieved by the three fractional lasers [Table 2] and [Figure 4]a-c. As different fractional lasers have different settings (mJ/microbeam), it is practically useful to statistically analyse the mean depth (μm/mJ) achieved by the lasers used [Table 2]. The data given in [Table 2] can give a rough assessment of the probable depth that can be achieved depending on the dose and laser used. The two studies , where comparative data are available regarding the depth achieved show variable results. 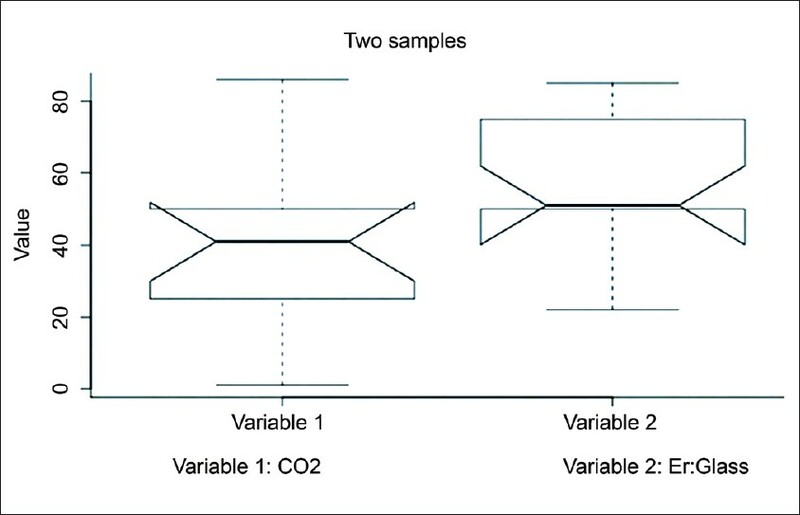 While [Figure 3]c reveals that the fractional Er:YAG laser is superior to other lasers, [Figure 3]b shows that the fractional CO 2 laser achieves a depth comparable to the fractional Er:YAG laser. Interestingly, [Figure 3]c shows that the NAFR (1440 nm) laser achieves a similar depth as the AFR (10600 nm) laser. These variations are probably because of the variable settings and substrates used. To overcome these variations, we statistically analysed the depth of penetration [Table 1] achieved by various fractional lasers, to average out the minor variations in doses. Our analysis revealed that the mean depth of penetration varied [Figure 5]a-c, with NAFR laser (Er:glass, 679 μm) achieving a depth that was less than that of the AFR lasers (Er:YAG, 825 μm, and CO 2 895 μm; P<0.05). On the facial skin though, the difference in the histological depth of the three fractional lasers (1540, 2940 and 10600 nm) would probably be similar for superficial atrophic acne scars [Figure 3]a. For deeper scars, the AFR lasers, at least in theory, would be better as they penetrate deeper than NAFR lasers, but as seen in [Figure 3]a, the depth achieved is probably not deep enough to ameliorate the ice pick scars [Figure 3]a. Thus on statistical analysis of the existing data, we can conjecture that there is evidence, both mathematical and substrate based, which can help predict the depth achieved by a particular laser. But the extrapolation of existing data toin vivo facial skin would depend on replicating the exact settings (pulses, duration, passes, energy and density) which is rarely the case. This and the variability of the tissues studied [Figure 2] probably account partially for the disparity in subjective and objective clinical results for acne scars [Table 3]. On the face of it, the most obvious drawback of the studies is the variation in the laser and settings used and the lack of histological data in relation to acne scars, except for three studies. ,, The most glaring drawback though is the non-uniformity of acne scar assessment scales. As has been seen in [Figure 3], the success of the lasers largely depends on the type of scar (ice pick, boxcar or rolling) and except for three studies ,, the other studies have not specified the scar studied. Studies that fail to distinguish between different subtypes of acne scars (e.g. rolling, boxcar, ice pick scars), have little objective value as the whole purpose of the fractional laser is to judge its use in specific scar subtypes. The only validated scoring scale (ECCA grading scale; échelle d'évaluation clinique des cicatrices d'acné) has not been used with NAFR/AFR lasers. Ice pick scars do not usually respond well to fractional laser therapy which has been echoed in a study by Geronemus. It has been the experience of other authors , also that the depth of the ice pick scars is deeper than that reached with conventional skin resurfacing options. Thus, ice pick scars with deep bases are ideally treated with punch excision. Another study  which compared NAFR with CROSS found that though the CROSS technique was marginally better for ice pick scars, statistically this was not significant. It was suggested that CROSS could be used in focal areas with the fractional laser for the whole face. In our experience, focal TCA in pigmented skin leads to marked hyperpigmentation which makes it, in our opinion, not a desired line of therapy. The third study  that subclassified the scar types used a quartile scale and reported patient assessment which is always superior to the physician assessment and thus has less validity. Another problem is the lack of an objective assessment technique. As the acne scars have a three-dimensional quality, it is impossible to objectively assess it by visual comparison. The only objective tool is the software based on an optical profiling system (Primos Imaging; GFM; Tetlow, Germany),  which allows high-resolution topographical imaging of cutaneous scars and calculation of quantitative volumetric and depth changes in atrophic scar volumes before and after treatment. This has been used only in two studies , and one of them  did not study acne scars. All the other studies ,,,,,,,,,,,,,,,,,,,,,,, use either a patient or observer-dependent quartile scoring which is not an accurate indicator of acne scars improvement. The use of photography is also meaningless as it is again assessed by a quartile or self-devised scoring pattern by an investigator wherein the assessment of the depth of the scar is impossible. These factors combined with a lack of a proper acne scar type classification in most studies ,,,,,,,,,,,,,,,,,,,,,, makes the apparent wealth of data difficult to interpret vis-à-vis the type of acne scars. In spite of the disparate parameters, ,,,,,,,,,,,,,,,,,,,,,,,, the results are uniformly expressed as a percentage improvement. We statistically compared the improvement (in%) between the studies using NAFR and AFR lasers, excluding the studies where various modalities were combined. ,, The mean improvement of NAFR (50.2%) was better than that of AFR (42.62%;. [Figure 6]a, b and [Figure 7]). This paradoxical result with NAFR though is based on subjective assessment. The only study that evaluated objective improvement  with AFR showed a mean improvement in scar volume by 38% with a scar reduction of 35.6%. This gives a realistic improvement that can be achieved by probably the most effective fractional laser technology at present. Comparative well-done studies with standard protocols are few ,,,,,, and have been rarely been done for acne scars. Except for one study comparing AFR and NAFR  in acne scars that showed a marginal difference, no other study has compared the two technologies for acne scars. 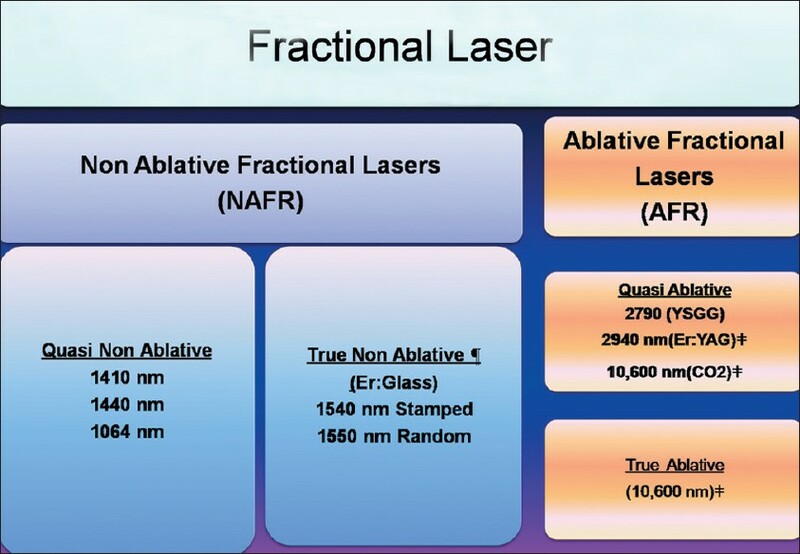 Interestingly, most laser manufactures make more than one of the three major lasers (NAFR/AFR) and it would be of interest to us if the findings that they have are put in the public domain. Thus, clinicians should avoid being influenced by promises and suggestions of the industry, which favour one device over the other. , It is thus important not to get swayed by data both published and unpublished as the non-uniformity of data collection and analysis is a hindrance for treating acne scars. , Probably, the manufacturers communicate data derived from ex vivo studies and it is up to the clinicians to interpret the data realistically with regard to the facial skin. It is desirable for the laser surgeons to standardise dose depth penetration by using appropriate substrates (in vivo facial skin) at various doses before considering interventions. Our statistical analysis [Table 2], [Figure 5], [Figure 6] and [Figure 7] can enable the clinician to arrive at a reasonably accurate depth penetration to treat the individual scars. We have reliably shown that the results of the different studies are not as dramatic even by using subjective or objective analysis. Probably, the acne scars have a 'memory'  which is difficult to change by fractional lasers. It is likely that an appropriate balance between the depth and the collagen remodelling is necessary. The underlying molecular changes are not fully understood but have been postulated to be induced by time-dependent changes in heat shock proteins, transforming growth factor β, matrix metalloproteinases, hyaluronic acid (HA) synthetases, hyaluronidases and HA, among others. There is an emergent need for in vivo facial histological studies with objective acne scar evaluation after fractional lasers to settle this issue. 1. Huzaira M, Anderson RR, Sink K, Manstein D. Intradermal focusing of near infrared optical pulses: A new approach for non-ablative laser therapy. Lasers Surg Med 2003;32:17-38. 2. Khan MH, Sink RK, Manstein D. Intradermally focused infrared laser pulses: Thermal effects at defined tissue depths. Lasers Surg Med 2005;36:270-80. 3. Manstein D, Herron GS, Sink RK. Fractional photothermolysis: A new concept for cutaneous remodeling using microscopic patterns of thermal injury. Lasers Surg Med 2004;34:426-38. 4. Laubach H, Chan HH, Rius F. Skin responses to fractional photothermolysis. Lasers Surg Med 2006;38:142-9. 5. Hantash BM, Bedi VP, Sudireddy V, Struck SK, Herron GS, Chan KF. Laser-induced trans-epidermal elimination of dermal content by fractional photo-thermolysis. J Biomed Opt 2006;11:041115. 6. Thongsima S, Zurakowski D, Manstein D. Histological comparison of two different fractional photothermolysis devices operating at 1,550 nm. Lasers Surg Med 2010;42:32-7. 7. Geronemus RG. Fractional photothermolysis: Current and future applications. Lasers Surg Med 2006;38:169-76. 8. Bedi VP, Chan KF, Sink RK, Hantash BM, Herron GS, Rahman Z, et al. The effects of pulse energy variations on the dimensions of microscopic thermal treatment zones in nonablative fractional resurfacing. Lasers Surg Med 2007;39:145-55. 9. Farkas JP, Richardson JA, Hoopman J, Brown SA, Kenkel JM. Micro-island damage with a nonablative 1540-nm Er:glass fractional laser device in human skin. J Cosmet Dermatol 2009;8:119-26. 10. Walgrave S, Zelickson B, Childs J, Altshuler G, Erofeev A, Yaroslavsky I, et al. Pilot investigation of the correlation between histological and clinical effects of infrared fractional resurfacing lasers. Dermatol Surg 2008;34:1443-53. 11. Zelickson BD, Walgrave SE, Al-Arashi MY, Altshuler GB, Yaroslavsky IV, Childs JJ, et al. Semi-Automated method of analysis of horizontal histological sections of skin for objective evaluation of fractional devices. Lasers Surg Med 2009;41:634-42. 12. Dierickx CC, Khatri KA, Tannous ZS, Childs JJ, Cohen RH, Erofeev A. Micro-fractional ablative skin resurfacing with two novel erbium laser systems. Lasers Surg Med 2008;40:113-23. 13. Farkas JP, Richardson JA, Burrus CF, Hoopman JE, Brown SA, Kenkel JM. In vivo histopathologic comparison of the acute injury following treatment with five fractional ablative laser devices. Aesthet Surg J 2010;30:457-64. 14. Hantash BM, Bedi VP, Chan KF, Zachary CB. 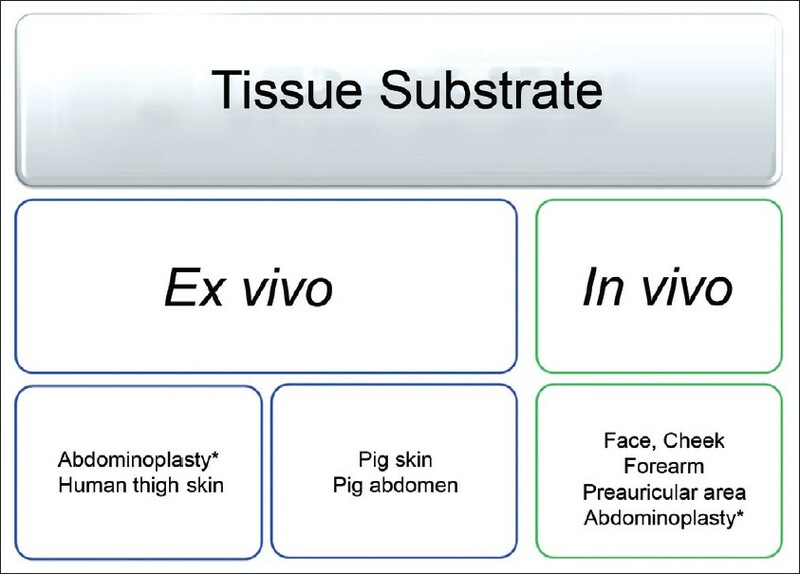 Ex vivo histological characterization of a novel ablative fractional resurfacing device Lasers Surg Med 2007;39:87-95. 15. Sasaki GH, Travis HM, Tucker B. Fractional CO 2 laser resurfacing of photoaged facial and non-facial skin: Histologic and clinical results and side effects. J Cosmet Laser Ther 2009;11:190-201. 16. Skovbølling Haak C, Illes M, Paasch U, Hædersdal M. Histological evaluation of vertical laser channels from ablative fractional resurfacing: An ex vivo pig skin model. Lasers Med Sci 2010;26:465-71. 17. Kist DA, Elm CM, Eleftheriou LI, Studer JA, Wallander ID, Walgrave SE. Histologic analysis of a 2,940 nm fractional device. Lasers Surg Med 2011;43:79-91. 18. Saluja R, Khoury J, Detwiler SP, Goldman MP. Histologic and clinical response to varying density settings with a fractionally scanned carbon dioxide laser. J Drugs Dermatol 2009;8:17-20. 19. Cho SB, Lee JH, Choi MJ, Lee KY, Oh SH. Efficacy of the fractional photothermolysis system with dynamic operating mode on acne scars and enlarged facial pores. Dermatol Surg 2009;35:108-14. 20. Yoo KH, Ahn JY, Kim JY, Li K, Seo SJ, Hong CK. The use of 1540 nm fractional photothermolysis for the treatment of acne scars in Asian skin: A pilot study. Photodermatol Photoimmunol Photomed 2009;25:138-42. 21. Goodman GJ. Post-acne scarring: A review of its pathophysiology and treatment. Dermatol Surg 2000;26:857-71. 22. Jacob CI, Dover JS, Kaminer MS. Acne scarring: A classification system and review of treatment options. J Am Acad Dermatol 2001;45:109-17. 23. Goodman GJ. Treatment of acne scarring in Ethnic Skin. In: Alam M, Bhatia AC, Kundlu RV, Yoo SS, Chan HH, (editors). Cosmetic Dermatology for Skin of Colour, 3 rd ed. New Delhi: Tata McGraw; 2009. p. 136-54. 24. 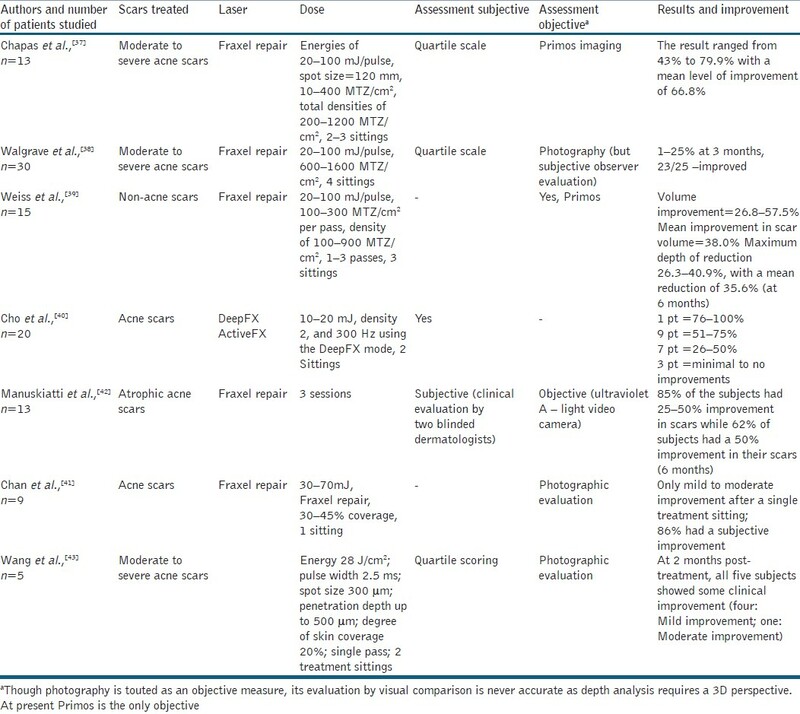 Sherling M, Friedman PM, Adrian R, Burns AJ, Conn H, Fitzpatrick R, et al Consensus recommendations on the use of an erbium-doped 1,550-nm fractionated laser and its applications in dermatologic laser surgery. Dermatol Surg 2010;36:461-9. 25. Trelles MA, Vélez M, Mordon S. Correlation of histological findings of single session Er:YAG skin fractional resurfacing with various passes and energies and the possible clinical implications. Lasers Surg Med 2008;40:171-7. 26. Trelles MA, Mordon S, Velez M, Urdiales F, Levy JL. Results of fractional ablative facial skin resurfacing with the erbium:yttrium-aluminium-garnet laser 1 week and 2 months after one single treatment in 30 patients. Lasers Med Sci 2009;24:186-94. 27. Karsai S, Czarnecka A, Jünger M, Raulin C. Ablative fractional lasers (CO 2 and Er:YAG): A randomized controlled double-blind split-face trial of the treatment of peri-orbital rhytides. Lasers Surg Med 2010;42:160-7. 28. Farkas JP, Richardson JA, Hoopman JE, Brown SA, Kenkel JM. TUNEL assay for histopathologic evaluation of irreversible chromosomal damage following nonablative fractional photothermolysis. Plast Reconstr Surg 2008;122:1660-8. 29. Bailey SH, Brown SA, Kim Y, Oni G, Abtahi F, Richardson JA, et al. An intra-individual quantitative assessment of acute laser injury patterns in facial versus abdominal skin. Lasers Surg Med 2011;43:99-107. 30. Xu XG, Luo YJ, Wu Y, Chen JZ, Xu TH, Gao XH, et al. Immunohistological Evaluation of skin response after Treatment Using a Fractional Ultrapulse Carbon Dioxide Laser on Back Skin. 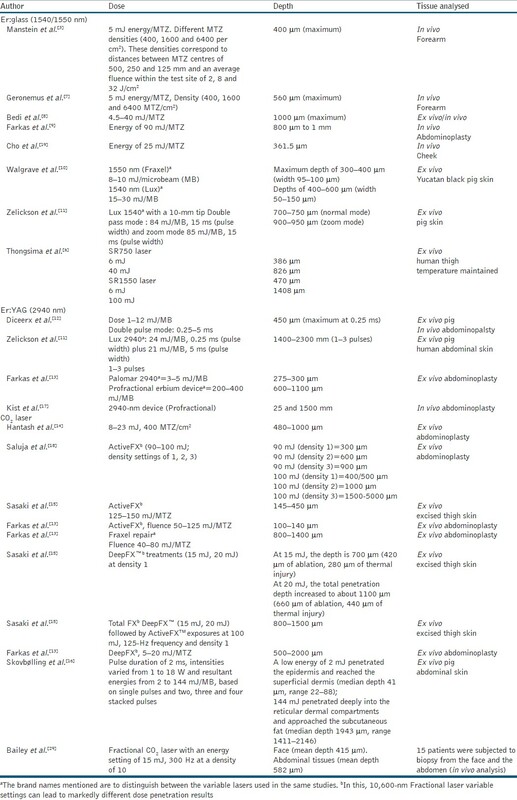 Dermatol Surg 2011;37:1141-9. 31. Jacques S, Wang L. Monte Carlo modeling of light transport in tissue. In: Welsh AJ, van Gement MJC, editors. Optical-thermal response of laser-irradiated tissue, Chapter 4, New-York and London: Plenum Press; 1995. p. 73-99. 32. Karl A, Stepp H, Willmann E, Tilki D, Zaak D, Knuchel R, et al. Optical coherence tomography (OCT): Ready for the diagnosis of a nephrogenic adenoma of the urinary bladder? J Endourol 2008;22):2429-32. 33. Naouri M, Atlan M, Perrodeau E, Georgesco G, Khallouf R, Martin L, et al. High-resolution ultrasound imaging to demonstrate and predict efficacy of carbon dioxide fractional resurfacing laser Treatment. Dermatol Surg 2011;37:596-603. 34. Fournier N, Mordon S. Nonablative remodeling with a 1,540 nm erbium:glass laser. Dermatol Surg 2005;31(9 Pt 2):1227-35. 35. Manstein D, Zurakowski D, Thongsima S, Laubach H, Chan HH. The effects of multiple passes on the epidermal thermal damage pattern in nonablative fractional resurfacing. Lasers Surg Med 2009;41:149-53. 36. Kono T, Chan HH, Groff WF, Manstein D, Sakurai H, Takeuchi M, et al. Prospective direct comparison study of fractional resurfacing using different fluences and densities for skin rejuvenation in Asians. Lasers Surg Med 2007;39:311-4. 37. Chapas AM, Brightman L, Sukal S, Hale E, Daniel D, Bernstein LJ, et al. Successful treatment of acneiform scarring with CO 2 ablative fractional resurfacing. Lasers Surg Med 2008;40:381-6. 38. Walgrave SE, Ortiz AE, MacFalls HT, Elkeeb L, Truitt AK, Tournas JA, et al. Evaluation of a novel fractional resurfacing device for treatment of acne scarring. Lasers Surg Med 2009;41:122-7. 39. Weiss ET, Chapas A, Brightman L, Hunzeker C, Hale EK, Karen JK, et al. Successful treatment of atrophic postoperative and traumatic scarring with carbon dioxide ablative fractional resurfacing: Quantitative volumetric scar improvement. Arch Dermatol 2010;146:133-40. 40. Cho SB, Lee SJ, Kang JM, Kim YK, Chung WS, Oh SH. The efficacy and safety of 10,600-nm carbon dioxide fractional laser for acne scars in Asian patients. Dermatol Surg 2009;35:1955-61. 41. Chan NP, Ho SG, Yeung CK, Shek SY, Chan HH. Fractional ablative carbon dioxide laser resurfacing for skin rejuvenation and acne scars in Asians. Lasers Surg Med 2010;42:615-23. 42. Manuskiatti W, Triwongwaranat D, Varothai S, Eimpunth S, Wanitphakdeedecha R. Efficacy and safety of a carbon-dioxide ablative fractional resurfacing device for treatment of atrophic acne scars in Asians. J Am Acad Dermatol 2010;63:274-83. 43. Wang YS, Tay YK, Kwok C. Fractional ablative carbon dioxide laser in the treatment of atrophic acne scarring in Asian patients: A pilot study. J Cosmet Laser Ther 2010;12:61-4. 44. Katz B. Efficacy of a new fractional CO 2 laser in the treatment of photodamage and acne scarring. Dermatol Ther 2010;23:403-6. 45. Park GH, Rhee DY, Bak H, Chang SE, Lee MW, Choi JH, et al. Treatment of atrophic scars with fractional photothermolysis: Short-term follow-up. J Dermatolog Treat 2011;22:43-8. 46. Hasegawa T, Matsukura T, Mizuno Y, Suga Y, Ogawa H, Ikeda S. Clinical trial of a laser device called fractional photothermolysis system for acne scars. J Dermatol 2006;33:623-7. 47. Alster TS, Tanzi EL, Lazarus M. The use of fractional laser photothermolysis for the treatment of atrophic scars. Dermatol Surg 2007;33:295-9. 48. Glaich AS, Goldberg LH, Friedman RH, Friedman PM. Fractional photothermolysis for the treatment of postinflammatoryerythema resulting from acne vulgaris. Dermatol Surg 2007;33:842-6. 49. Lee HS, Lee JH, Ahn GY, Lee DH, Shin JW, Kim DH, et al. Fractional photothermolysis for the treatment of acne scars: A report of 27 Korean patients. J Dermatol Treat 2008;19:45-9. 50. Weiss R, Weiss M, Beasley K. Long-term experience with fixed array 1540 Fractional erbium laser for acne scars. Kissimmee, FL: Abstract presented at American Society for Laser Medicine and Surgery Conference; April 2008. 51. Chrastil B, Glaich AS, Goldberg LH, Friedman PM. Second-generation 1,550-nm fractional photothermolysis for the treatment of acne scars. Dermatol Surg 2008;34:1327-32. 52. Kim S, Cho KH. Clinical trial of dual treatment with an ablative fractional laser and a nonablative laser for the treatment of acne scars in Asian patients. Dermatol Surg 2009;35:1089-98. 53. Hu S, Chen MC, Lee MC, Yang LC, Keoprasom N. Fractional resurfacing for the treatment of atrophic facial acne scars in Asianskin. Dermatol Surg 2009;35:826-32. 54. Cho SB, Lee SJ, Kang JM, Kim YK, Oh SH. Combined fractional laser treatment with 1550-nm erbium glass and 10 600-nm carbon dioxide lasers. J Dermatolog Treat 2009;1:1-3. 55. Kim HJ, Kim TG, Kwon YS, Park JM, Lee JH. Comparison of a 1,550 nm Erbium: Glass fractional laser and a chemical reconstruction of skin scars (CROSS) method in the treatment of acne scars: A simultaneous split-face trial. Lasers Surg Med 2009;41:545-9. 56. Kang WH, Kim YJ, Pyo WS, Park SJ, Kim JH. Atrophic acne scar treatment using triple combination therapy: Dot peeling, subcision and fractional laser. J Cosmet Laser Ther 2009;17:1-4. 57. Cho SB, Lee SJ, Cho S, Oh SH, Chung WS, Kang JM, et al. Nonablative 1550-nm erbium-glass and ablative 10 600-nm carbon dioxide fractional lasers for acne scars: A randomized split-face study with blinded response evaluation. J Eur Acad Dermatol Venereol 2009;24:921-5. 58. Hedelund L, Moreau KE, Beyer DM, Nymann P, Haedersdal M. Fractional nonablative 1,540-nm laser resurfacing of atrophic acne scars. A randomized controlled trial with blinded response evaluation. Lasers Med Sci 2010;25:749-54. 59. Mahmoud BH, Srivastava D, Janiga JJ, Yang JJ, Lim HW, Ozog DM. Safety and efficacy of erbium-doped yttrium aluminum garnet fractionated laser for treatment of acne scars in type IV to VI skin. Dermatol Surg 2010;36:602-9. 60. Friedman PM, Skover GR, Payonk G, Kauvar AN, Geronemus RG. 3-D in-vivo optical skin imaging for topographical quantitative assessment of non-ablative laser technology. Dermatol Surg 2002;28:199-204. 61. Field LM. Laser resurfacing hysteria. The media, the marketers, the companies, and us. Dermatol Surg 1998;24:684-6. 62. Field LM. Never, ever a twinkle from billboard advertising-Nor from advertising budgets. Dermatol Surg 1999;25:828-9. 63. Helbig D, Paasch U. Molecular changes during skin aging and wound healing after fractional ablative photothermolysis. Skin Res Technol 2011;17:119-28. 1 Which Type of Atrophic Acne Scar (Ice-pick, Boxcar, or Rolling) Responds to Nonablative Fractional Laser Therapy?